"That other luthier said you need a neck reset? Pfft...hold my beer!" Last edited by marius; 11-09-2018 at 04:07 PM. No neck reset. Just lower the whole bridge into the top or sand the top so thin, it lowers it. That's what I'm thinking John. I had an uncle who, when he was talking about our 6" dropped living room and we were saying it really should be the same level...... he actually said, "You should probably fill in the living room." I said, of course, as apposed to what? He said (no lie) "Well, vs. lowering the rest of the house...."
We sold that house, the buyer who was handicapped had the living room filled in. maybe we should've given him the other option??? LMFAO!!!!! HOOOO boy!!!! For the sake of clarity, I have no affiliation with the guitar or it’s owner. 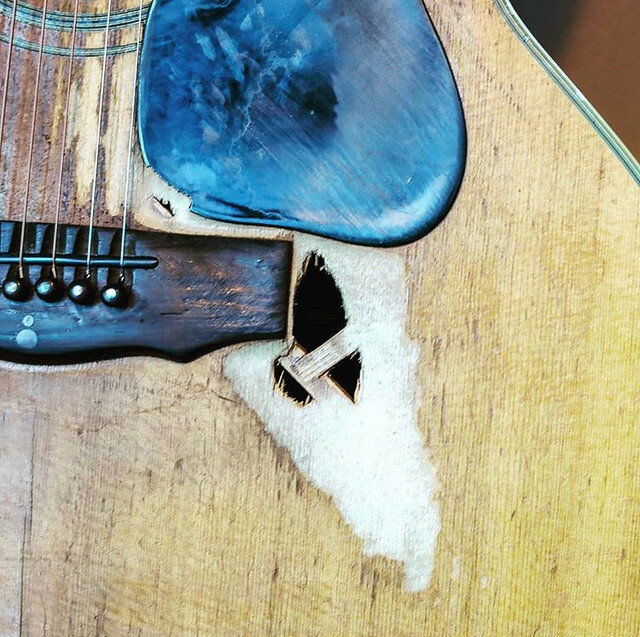 I came across the photo on the Guild Guitars Instagram feed and was astounded at the effort someone went to to avoid a neck reset. Looks like the bridge was lowered before it was “scalloped”. Just thought I’d share...more as a “caption this photo” joke. It's a very good photo that tells a story. That other luthier said you need a neck reset? Pfft...hold my beer! wait, is this Guild for sale?